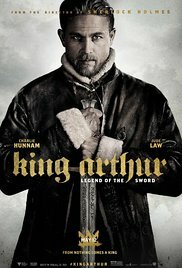 New on Bluy-ray and DVD for August 8, 2017 - "King Arthur: Legend of the Sword" and "Snatched"
Robbed of his birthright, Arthur grows up the hard way in the back alleys of the city. But once he pulls the sword from the stone, he is forced to acknowledge his true legacy - whether he likes it or not. “King Arthur: Legend of the Sword” isn't a standard retelling of the Arthurian tale, as director Guy Richie has retooled the legend for a new generation. The film is an action / adventure at its heart. Arthur, played by Charlie Hunnam, is orphaned by the murder of his father and mother by the forces of his evil uncle, played by Jude Law. Growing up in the worst conditions in England, Arthur is tempered and forged in his temperament and fighting ability, but is content to live in the shadows. And, unlike other retellings of this tale, when it comes time for him to claim his rightful heritage, he doesn't want to step into the limelight. It is when Arthur finally realizes that by not stepping into his rightful place is a very selfish act, does the once and future king of England begin to think like a monarch. “King Arthur: Legend of the Sword” is an action packed sword and sorcery film exploring the 'hero's journey' of a very reluctant hero. Check out other 'King Arthur' films. check out dvd.netflix.com and check out "Camelot," "The Sword and the Stone," "Excalibur," and "King Arthur" available now at Netflix DVD. Sign up and get your first month FREE! In the film, a woman who has recently been dumped brings her mom to South America on the romantic vacation she booked with her ex. “Snatched” is a situation comedy film, meaning that the funny moments in the film come from the situations the lead characters keep getting themselves into. The problem is the script runs out of situations early on and keeps repeating itself. Both Amy Schumer and Goldie Hawn are watchable in the film, but neither connect with the audience or each other. In the end “Snatched” ends up being another anemic one-joke comedy using sight gags instead of good writing. “Snatched” gets a D and is rated R.
Check out more Goldie Hawn films including "Overboard," "Housesitter," "Cactus Flower," "Bird on a Wire," Deceived" and "The Banger Sisters" at dvd.netflix.com today.